machine to obtain lifting access e.g. fork lift truck. See diagram in reference section for minimum space requirements for normal operation and maintenance. Ambient temperatures higher than 46° C (115° F) must be avoided as well as areas of high humidity. Consider also the environment surrounding or near the compressor. The area selected for the location of the compressor should be free of dust, chemicals, metal filings, paint fumes and overspray. Hard surfaces may reflect noise with an apparent increase in the decibel level. When sound transmission is important, a sheet of rubber or cork can be installed beneath the machine to reduce noise. Flexible piping may be required. It is recommended that provision be made for lifting heavy components during major overhaul. Use only lifting points provided. Minimum space in front of control panel door as required by National or Local codes must be maintained. The compressor can be installed on any level floor capable of supporting it. A dry, well ventilated area where the atmosphere is as clean as possible is recommended. 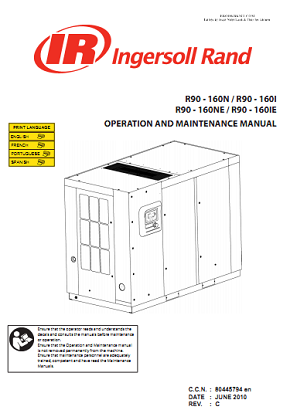 Sufficient space all round and above the compressor must be allowed, to enable the effective removal of the cooling air which, in turn, will reduce the risk of recirculating the cooling air back through the compressor.